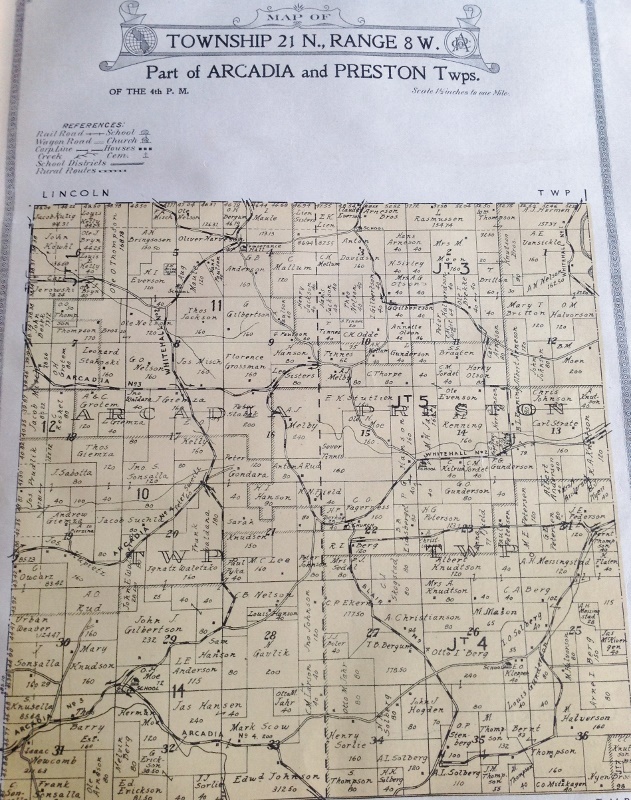 Plat maps from 1914. The Town of Arcadia is the largest town in the county. it also has the largest city, Arcadia, in Trempealeau County. 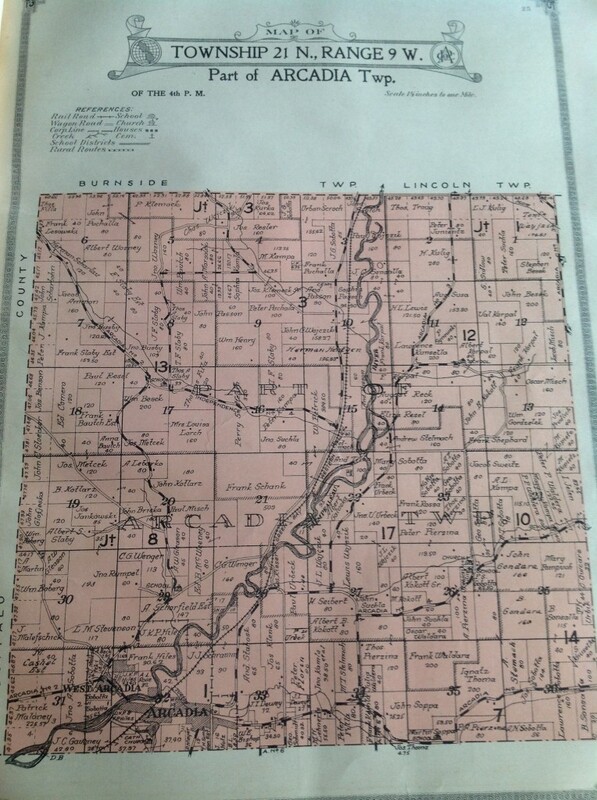 The Town of Arcadia was created in Novemeber of 1856 Arcadia consisted of all the present Town except the strip in T20 Sec 8 and everything north of the present Town to the south line of T 24. In April 1857 the first Town meeting was held at the home of David Bishop. The earliest settlers in what is today the city of Arcadia were David and Collins Bishop, George Dewey, George Shelley and James Broughton.. The name Arcadia, was suggested by Mrs David Bishop who in turn, had the name from Noah Comstock who claimed the area reminded him of the Arcadia region in Greece. The first school was founded in 1857 with Sarah McMasters as the first teacher. A store was opened by George Shelley and a blacksmith shop by Albro Mattison. David Massuere built a flour mill in 1860. At first Arcadia was located high and dry above the river bottom but when the train came through in 1873, the tracks were laid close to the river. The town moved down into the bottom land to be near the train tracks and has suffered from regular flooding ever since. Today Ashley Furniture and Golden Plump have large factories in Arcadia. 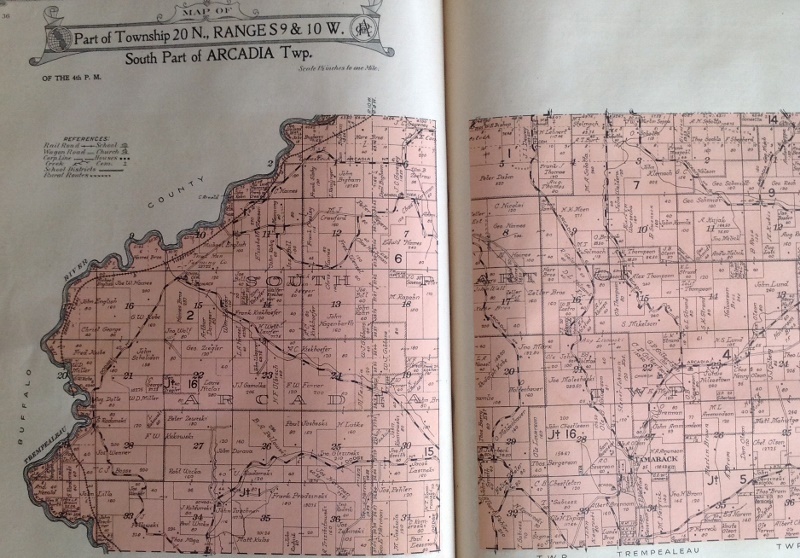 The Town of Arcadia had 19 rural school districts- American Valley, Cortland, Holcomb Coulee, Kolstad, Korpal Valley, Latsch Valley, Lewis Valley, North Creek, Norway Valley, Meyers Valley, Oakdale, Oak Ridge, Penny, Rainey Valley, Ridge, St Michael Parochial, Sunnyslope, Williamsburg (Passow) and Woychik. The nationalties of the residents of the Town of Arcadia were primarily Polish, German and Norwegian. Other small trading centers in the Town were Williamsburg and New Tamarack.